Hour chart looks bullish since rebounded from the low of 0.170 made during late trading hours on April 19, which also marks 50% retracement of the April 17-19 breakout run-up. A retracement of an uptrend of <61.8% is consider bullish according to Fibonacci. Hourly candles is also supported by a short-term trendline (dark green, supporting intraday price movement), & also the mid-term trandline (light blue, supporting days of price movement). However, the shortcoming for today's bullishness would be the many buyers who had been rushing into the counter on the breakout day (April 17), with a whopping 515.664mil volume transacted. This made up to ~91% of AGLOBAL's 568.753mil share capital. Imagine a portion of that volume being force-sell later in the afternoon. We will be seeing some drastic drop of the share price. However, the pass few days saw some handsome volume (200-400mil+) transacted also, which shall provide some shelter to the force-selling effect later, presuming most of the traders already taken their profit throughout the 3 days. 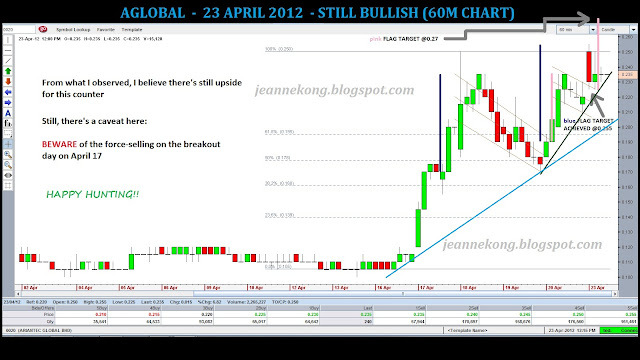 An open above Friday's high is a confirmation of the bulls strength & also the continuation of the uptrend. Shall the force-selling effect came on hard, we shall see support at around 0.200-0.210 region & any drastic drop below 0.195 level shall be a signal of the bears taking-over. We shall see to that. On the daily, the trend is clearly bullish & a fibo extension gives a target price of 0.280 shall the price holds above the 0.190 level. 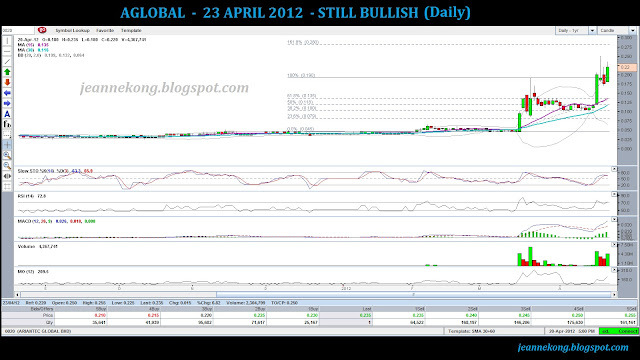 This roughly coincides with the hourly target of 0.270. Hence, a good take profit point. We shall then let the price correct decently before we find another good entry to ride yet another wave up!